Today I have an interview with Lauren Hunter and a giveaway of her latest book, The Promise. I’m not sure exactly. It depends on what you consider to be part of writing the book as an author. I consider the writing and the research to be two completely separate processes, but they tend, for me, to occur simultaneously. Yes, I will do a lot of research in advance, but as I am writing the book I will come across something or a situation that needs details. I need to know how I can make that scene work for it to be accurate for the time in which it takes place. So a great deal of the time I cannot research in advance as the story will tell me what kinds of details I will need to know, and that happens as I am writing it. I would like to say two or three months, but there was a great deal of research time in there. The original story was 120,000 words and had three main characters. I took the story and split it off into two. I now see the part I removed can be used for two more stories quite nicely. For me it would be the research, but I don’t really consider it to be hard. I love to research and find out all kinds of details. It fascinates me to learn about how people lived and thought in another time and place. I love to find out little things, little everyday details. To me it brings the book that much more to life when providing those small pieces of everyday living into the story. When it comes to the writing of the book all of it is my favourite. I love to be in the moment of writing that scene or chapter. The excitement of where it’s taking me at any given time. The characters decide what will happen, and what will be said and done, and I’m just along for the ride. Coming up with the perfect idea or solution to make a situation or scene work within the storyline, is thrilling to me. I’ll want a story to be in a certain place or time, and I’ll realize that can’t happen. I then must come up with a reason as to how it can be, and the ideas will literally just start coming to me out of no where as to exactly how to make it work, and I see that it works perfectly. It explains it, and makes sense within the story so I can use it in the way I want to. Very, very extensive. I have about two hundred pages of hand written notes, and about three inches thick of printed pages on every aspect of this era I could think of. Every detail, down to what kind of wax they used in the candles for the different rooms. All of this can be useful in describing a scene to give it more depth, placing the reader into the moment by using tiny descriptions slipped into the scenes that add subtle nuances. I personally love reading everything I can about the era I am writing in. I find it fascinating to know the tiny details of everyday living, all the way to what was going on at that time in history, and how it may affect my characters in their lives. I can then decide how much or how little that may impact my characters, and how I can use that in my story. When it comes to the paranormal aspects of these regencies I can let my imagination run free, and take it wherever I wish, as long as it makes it the story I want it to be. But sometimes you still need to consult an expert on the era, and I have someone that has been generous enough to help me when I can’t find the information I need. I’m not sure how many authors feel this way but I don’t ever have just one from any one book. Yes, I may have characters I do like and ones I don’t, but I never have just one favourite. As authors our characters are like children to us, and we come to love them as though they are real. If ever I kill off a character I admire I will feel devastated in the moment, and will actually grieve and cry. I know that sounds really stupid, but as writers our characters are real to us. I come to know them and love them, for me it’s all part of the writing process. Readers, too, can have that connection with our characters as well. They come to think of them as real living people, and feel along with them when things go wrong, or even right. Lauren Hunter is a writer of paranormal romance and Regency paranormal romance novels, with plans to write in a variety of other genres, including time travel, angel, ghost, and contemporary romance. Her paranormal romance, The Coffee Shop, and her paranormal Regency, The Promise, are now available through Musa Publishing, with the second and third installment of a paranormal regency trilogy soon to be released. 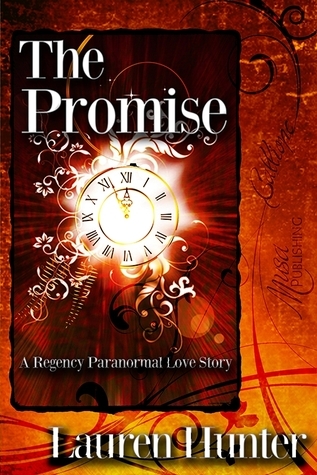 Win an ebook copy of The Promise. Open worldwide until midnight EST Nov 20, 2012. Please enter using the Rafflecopter below.